500 ltr/h The maximum amount of water the unit will use per hour. A normal garden tap will flow at 600 Litres Per Hour. 8m Hose The length of the high pressure hose between the base unit and Handgun. 145 Bar The max working pressure of the unit, for psi times the bar by 14.50 Always look for a good combination of bar and waterflow. Combining power & efficiency, the Karcher K5 Premium Full Control Plus is a durable high-range machine, ideal for a medium to large sized domestic environments while its upright design, sturdy wheels & telescopic handle make the unit extremely user friendly & ensure excellent mobility. This machine comes complete with the new full control plus handgun with LCD display & pressure regulation buttons, as well as the multijet 3-in-1 lance. Simply twist the lance to select from dirtblaster, detergent application or variable pressure output options. Once you have chosen your output simply squeeze the handgun and you're ready to clean. When using the variable pressure output on the multijet lance you can simply alter the pressure output by pressing the pressure control buttons on your handgun. The LCD display on the handgun will clearly display the current pressure output selection. The K5 Premium Full Control Plus also features an on-board hose reel with an integrated hose guide, providing a convenient storage solution for the hose as well as quick & easy retraction after use. 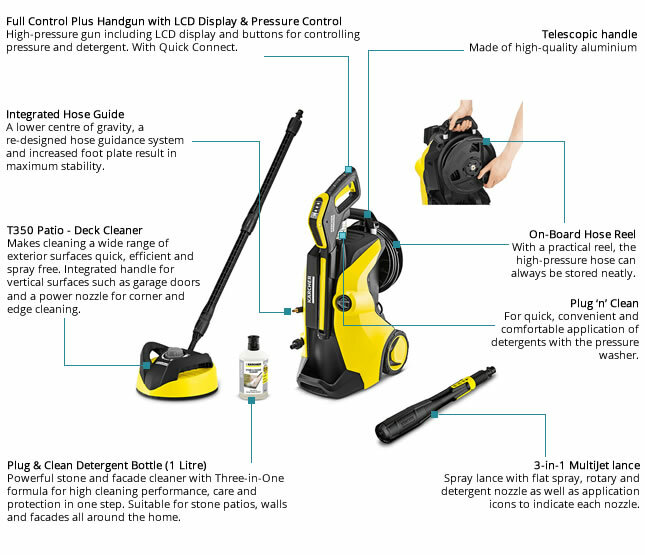 The K5 Premium Full Control Plus Home package also comes complete with the T350 T-Racer, a patio and path, decking and vertical surface cleaning attachment from Karcher. This accessory reduces cleaning tasks by up to five times thus decreasing motor ware, water usage & the time spent cleaning by the consumer. The T350 caters for differing & uneven floor or wall surfaces being cleaned while the circular outer casing protects from splash back, which stops irritating dirt being spread around your home. Full Control Plus Handgun & 3-in-1 MultiJet Lance - Pressure can now be regulated pressing the buttons on the Full Control Plus handgun until the desired pressure setting is shown on the handguns LCD diplay. The 3-in-1 MultiJet lance offers 3 outputs - dirtblaster for stubborn stains & tough dirt, detergent application at low pressure to ensure optimum chemical coverage & variable spray - low, medium & high output options controlled by the Full Control Plus handgun. Parking Position & On-Board Storage - The full control plus handgun & the connected spray lance can be stored on the pressure washer during breaks in cleaning, whislt remaining easily accessible. After finishing use the handgun & lances can be stored on board the machine to save space & to ensure they are easily located when you next use the machine. Telescopic Handle - The compeletly retractable transport handle offers a compact storage solution whilst maintaining the machines excellent mobility. The handle is made from high quality aluminium & extends to a convenient pulling height. Stability & Low Centre of Gravity - the K5 Premium Full Control features a stability foot (which doubles as a second carrying handle) whilst the hose guidance through the body of the machine ensures the risk of tipping / tilting the machine is greatly reduced. Storage of the hose on the rear of the machine also creates a lower centre of gravity. The K5 Premium Full Control Plus features a long life water cooled induction motor, reducing energy use, water wastage & increasing motor life through the advanced cooling. Thanks to the advanced pump engineering the K5 Premium Full Control is covered by a full 5 year manufacturers warranty (see warranty tab for details). Had previous Karcher jet washers that have lasted years, first time with a K5 Premium full control, not disappointed at all, went together with minimal fuss, took a while to get the gun to connect to the washer but not a problem. Really powerful and so easy to switch between pressures whilst using it. Excellent service and price from Cleanstore would really recommend this company. Excellent product - after reading lots of reviews on finding which Karcher product to purchase, I chose the K5 even though the K4 was the most popular. I chose K5 because of the longer lead and Higher water jet pressure and output. Amazing job - cleaned the whole of the patio, paths, driveway - old wooden bench Plus more in eight hours. would have taken two days otherwise with a standard pressure washer. Very powerful, with various attachments, nozzle pressures to suit all materials soft and hard. Also the shampoo bottle is great. was going to hire someone to do the driveway etc but for the same price managed to purchase a model that i can use whenever I want. Cleanstore price was amazing deal almost �80 cheaper than nearest rival and also the accessories included was worthwhile. I was so surprised delivery came in two days with no extra cost, and the cleaning bottles were half the price from other retailers. Thank you Cleanstore + they were the only website to mention the �30 cashback on this product directly from Karcher. I bought this for cleaning the cars and also two large concrete driveways and some decking. It is very easy to use for all these jobs. I was impressed how quickly it cleaned the concrete drives. The full control plus system is very convenient, giving six pressure settings for the flat jet nozzle. The dirt grinder nozzle is very effective on concrete etc. I didn't find any great benefit from using the T-Racer surface cleaner on the concrete drives as you have to clean off twigs and other debris first and then rinse off the dirt afterwards, by which time you might just as well have used the dirt grinder nozzle on its own. The hose drum is convenient and the 8m hose length useful - I think that less would mean you were moving the pressure washer a lot for most jobs. The hose is quite stiff and forms loops when extended but this is not a major issue. Niggles are that the handle stays extended if you give it a sharp pull but the lock is not very positive. The mains lead is supposed to be stowed in a pouch but it's not very convenient so I wind it round the handle instead. I can't comment on the long-term reliability but it seems solidly built.